The Hayloft Self-cateringThe Hayloft is a luxury holiday cottage converted from a limestone barn in South Lakeland's stunning Cartmel peninsula. It has 3 bedrooms, including an Antique Victorian double bed, conservatory, games room and galleried lounge looking out to Morecambe Bay. The Hayloft is located within 2 miles of picturesque Cartmel and Grange-Over-Sands and is 8 miles from lake Windermere. 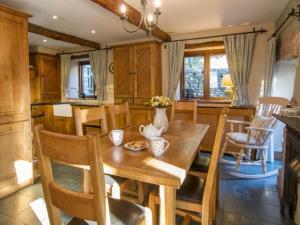 It combines stone and oak with beautiful furnishings and is warm and cosy, a real 'home-from-home'. The Hayloft offers flexible accommodation and sleeps 6-7 in a downstairs antique Victorian double room with adjacent shower room, an upstairs double bedroom and twin bedroom. The upstairs lounge has a Smart TV, sofa bed and window seats overlooking Morecambe Bay. The bespoke open plan farmhouse kitchen/dining room is very well equipped and leads to the fully-heated conservatory, overlooking a pretty enclosed lawn and borders. The Hayloft has parking for 2 cars and a stone-built stable converted into laundry and games rooms with table tennis, darts and table football. Changeover is on Friday. Rates include all bed linen, towels, services and 2 pets. Freeview TV, there are leisure spas at the hotels in the area, 2 miles away. Children welcome from any age. LAST JUNE WEEK: Fri 21st - Fri 28th (£650/£490 Break); JULY BREAK: Tues 2nd - Fri 5th (£450); LAST SUMMER WEEK: Fri 12th - Fri 19th July (£800/£600); AUG BREAKS: Tues 30th - Fri 2nd (£500) & AUG: Tues 13th - Fri 16th (£500). The Hayloft offers weekly bookings starting on Friday and sometimes short breaks. From M6 jct 36 travel along A591 until the first exit marked A590 to the Lake District Penninsulas. Take B5277 to Grange-Over-Sands and Allithwaite. Details are provided on booking. Trains run to Grange-Over-Sands from Manchester airport, often changing at Lancaster. Coaches stop there and X35 bus runs from Kendal to Grange. You can live downstairs as the bedroom, shower room, lounge, kitchen, dining room and toilet are on the ground floor. There is no specific disabled access as it is an old barn.